Over the years I’ve seen all kinds of casino card games out there, but Stravaganza has somehow slipped through. I actually noticed it just recently after browsing around Bet365 Casino to check their latest promotions. This game uses a similar concept as many others – you compete against the dealer and your goal is to get a higher hand score than him. There aren’t any poker related combinations included and the game plays more similar to BlackJack if anything else. 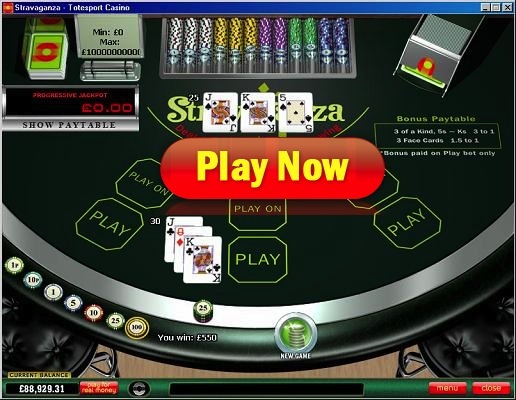 Stravaganza uses a three card concept – both player and the dealer get three cards dealt, when the hand is played in full. There are a couple of exceptions to this from the players side, as the options include surrendering to recoup half of your wager back, when certain point score is acquired. More on that later, though. The game, just like all other gambling ones, starts with placing wagers. You’ll have to put up a wager on the circled ”Play” field that will lead to two cards being dealt. Now there’s a decision that you have to make – either ”Play On” and take a third card or sit. Why would you ever not take the third card? It’s easy – you are required to put additional wager, equal to your ante bet, if you want to continue with the hand. If the initial two cards make up a point score of 5 or less, you can get your money back in full. If the two initial cards make up a point score of between 6 to 9, a ”rescue bet” option will appear and allow you to recoup half of your initial wager back. Any other point score will limit yourself to either taking another card or staying and most likely losing the initial ”Play” wager. To claim the progressive jackpot or any payouts associated with it (see payouts), you’ll have to make a wager by clicking on the little red light above the two betting circles. Note that this bet is only available in real money playing mode, so you won’t be able to place it playing free. In Stravaganza, hands are valued similarly as in BlackJack – numbered cards are worth their face value, all face cards are worth 10 points and aces are worth 1 point. Important: If the dealer holds a hands that consists of a red ace (either hearts or diamonds), you lose the hand right away, regardless of what hand combination is held. This isn’t the case only with the bonus payouts and the progressive jackpot. The standard payout for ”play” and ”play on” bets is even money – you will double up your wagers every time you win. However, there are a couple of bonus payout, when your hand consists of certain cards. There are three simple strategy tips that you’ll be able to apply, when playing Stravaganza online. When the initial point score of two cards is 5 or less – always take advantage of the option for taking your wager back. When the initial point score of two cards is between 6 to 8, always use the ”rescue bet” option. This game is available at all casinos that use PlayTech software, thus unfortunately USA players won’t be eligible. However, if you are not from there, feel free to play this game at Winner Casino who will also reward you with $/£30 in completely FREE credits after you’ve signed up! No deposit is required, but if you’re willing to make one – there’s also three deposit bonuses with up to $2,000 in free cash up for grabs! CLICK HERE to Join Winner Now!